The flirtation started with eatHarmony’s 29 Dimensions of a (vegetable) Chopped Salad. Then I tried La Scala‘s famous antipasto Chopped Salad and it turned into a sincere interest. 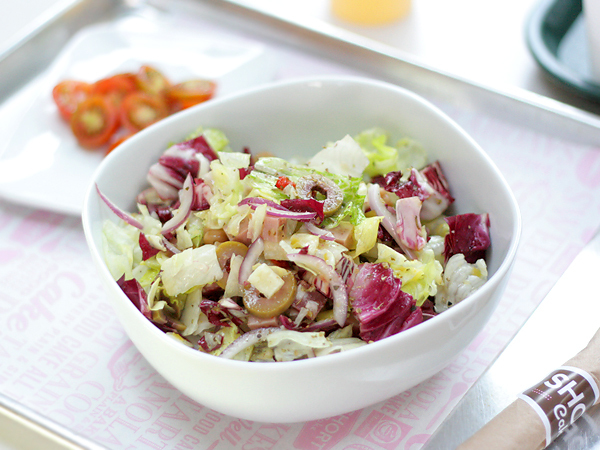 It started getting serious when I found myself ordering Nancy’s Chopped Salad every time we went to the Pizzeria. And then I finally brought it home. We hadn’t been to the Farmers Market, the “Original” at Third and Fairfax, for a few months. Not by any conscious choice, of course. We moved to a new house, and though it is still about the same distance from here as it was from there, something about it feels further away now that we’re on “this side” of town. Out of both energy and ideas for a meal over the weekend, we went back to the Farmers Market, which is essentially a more sophisticated way of eating in a mall food court. Cheap. Lots of options. Everyone can get what they want. Loteria Grill has great Mexican food and , but I’m starting to believe that the real reason we always end up there is the availability of beer at the next stand over. Once we discovered the Mee Goreng at Singapore’s Banana Leaf, we ate one or the other every other time. Somehow I wasn’t in the mood for either of our defaults. I wandered reluctantly toward the Korean place. I don’t know how I ended up at burger bar Short Order‘s little sister, Short Cake since I don’t eat desserts, pastries or sweets. I guess I was just as naturally curious as anyone in the LA “food scene” (pardon my use of that term, I hate it almost as much as I hate “foodie”) would be about the expansion of the Silverton Empire. I do, however, know how I ended up ordering and eating at Short Cake. I almost missed it on a menu full of croissants, muffins, pies and tarts, but it was there. Nancy’s Cubed Salad, a geometrically perfect permutation of the Chopped Salad at Pizzeria Mozza, was where a salad should be in Nancy’s world, at the end, after dessert. The Cubed Salad might be my new favorite default, especially since I know how to make it at home. But of course, woman cannot live on Chopped Salad alone, so I need some inspiration. What is your favorite salad?